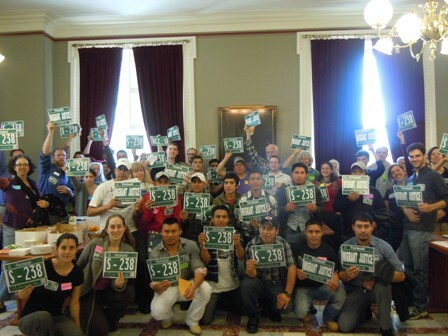 An atmosphere of positive energy and a sense of organized chaos coated Room 10 of the State House on Wednesday, April 18th as more than 60 migrant workers, farmers, and community allies gathered to celebrate passing S-238, the study committee on drivers licenses, as a significant step towards building a movement for drivers licenses for all Vermont residents next year. We kicked off the morning with a teach-in and constant revolving door of legislator visits who had been flooded with notes from constituents invited to come join us. While first time attendees participated in the teach-in, seasoned workers and community allies met with legislators seeking to drum up support for a driver's license bill next year. And it worked! We moved several new legislators to declare that they would fight with us until we had a victory! During the teach-in, Abel Garcia, farmworker leader from Craftsbury, shared that a driver’s license would allow him to see his family more often. “My son lives 50 miles away but I’ve only visited him a few times”. Senator Baruth and Senator Kittell highlighted that he and his colleagues were moved to support the migrant workers’ plight upon hearing Danilo’s personal testimony of being in a farming accident and going without treatment because he couldn’t drive to a hospital. Natalia Fajardo of Migrant Justice explained the importance of the day, emphasizing that many more legislators need to be moved, like Senators were, in order to build the necessary support to pass a driver’s licenses bill and to embrace migrant workers as neighbors and community members. 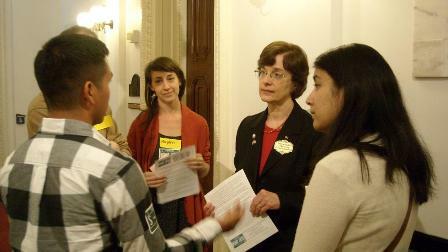 Farmer Phyllis Bowdish explained that her farm worker employees are like family to her. Rev. Will Burhans complemented, “this is an issue of human rights for my congregation”. 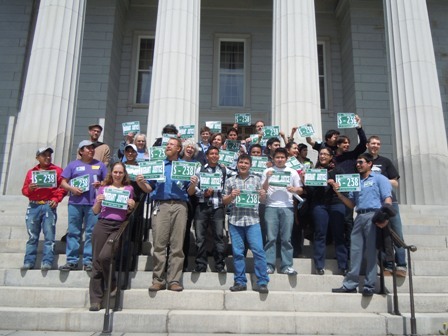 Secretary of State Chuck Ross closed off the panel sharing how crucial migrant workers are to Vermont’s agriculture. We then broke into regional groups and role-played how to win over legislator support with farmworker leaders acting as spokes people for each group.